Happy Birthday, JRR Tolkien, and Thanks! It’s the day after JRR Tolkien’s birthday. Yesternight, though the wind whooshed through skeletal rather than fully-leafed trees in the nearby woods, I thought of Bilbo’s birthday party tree: “There was an especially large pavilion, so big that the tree that grew in the field was right inside it, and stood proudly near one end… Lanterns were hung on all its branches” (LOTR: The Fellowship of the Ring, p26). For on the evening of January 3, 2011 at my home, Wood’s Edge, stars twinkled between the tree branches and the forest seemed alight with distant lanterns. And I thought about the debt I owed Tolkien. I was a girl when first I read: “In a hole in the ground there lived a hobbit…It had a perfectly round door like a porthole, painted green, with a shiny yellow brass knob in the exact middle…This hobbit was a very well-to-do hobbit, and his name was Baggins…I suppose hobbits need some description nowadays, since they have become rare and shy of the Big People, as they call us” (The Hobbit, p11-12). And I quite understood the need for further explanation, since I had to often explain the various little folks I spotted while hiding beneath droopy pines and sprawling forsythias. A few of the elderly adults with whom I shared my stories and sketches of these creatures, smiled a knowing smile and whispered, “Do what you love.” Most grown-ups discouraged such foolishness, and suggested I find more realistic and practical subject matter for my artistic endeavors. “No one will pay to read such crazy stuff” and “Medical illustration, now there’s something you can make money at” were oftentimes what I’d be told by well-meaning relations. Thus, it has taken me a lifetime to feel comfortable in my skin. And I quite admire those lucky writers and illustrators who’ve managed to embrace from the beginning their fantastical leanings. So yester-evening as twilight crept from the shadowy places beneath the maples, I raised a mug of spiced tea to Tolkien. “Happy Birthday, to a man of great imagination who opened the doors to Middle-earth for us all,” I said. From childhood, Tolkien and his fellow fantasy writers encouraged my imagination’s wanderings, and for that, I owe them a great debt. Tolkien wrote,“Not all those who wander are lost,” and finally as silver hairs twine amongst the brown, I not only understand Tolkien’s words, but have the courage to embrace my own worlds and the creatures who inhabit them. And so I invite you, dear readers, to sample a few of those tales in my books: The Greener Forest and Owl Light. And for you in the UK, here’s the link. 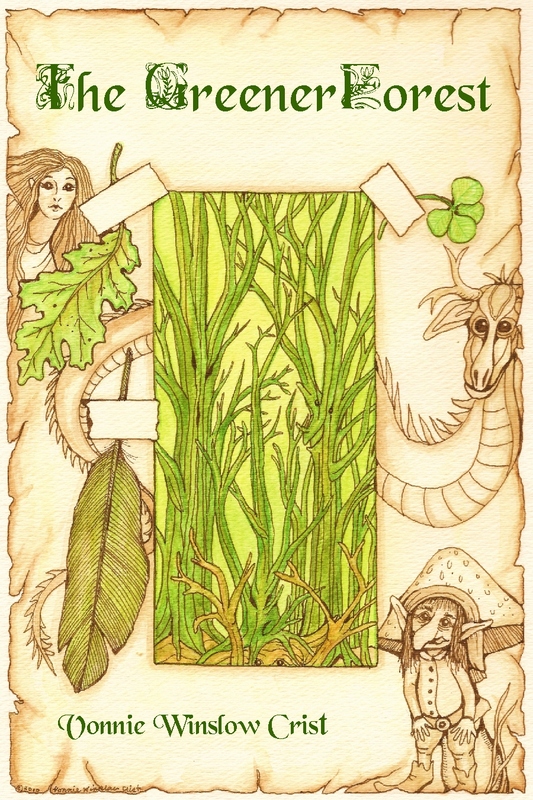 The Greener Forest is a collection of short stories and a couple of poems each of which features one or more Faerie or otherworldly creatures. Examples: Writers of the Future Honorable Mention story, “Blood of the Swan,” relies on both Celtic & Norse mythology and features swan maidens, the Grim, Uldra, Ag-Anker (Grim’s hounds), and people like you and me in a winter tale of quest & sacrifice. In “Birdling,” carrying for an orphaned nestling results in a meeting with a Brown Man and others. “Appleheads” is set in a rural town where Miss Greenspun carves applehead dolls of a most extraordinary nature under the watchful gaze of her dog/goblin and cat/bogle. All is going well till a well-meaning young man gets involved. The gates between Faerie and this world seem to be thinning in “Tootsie’s Swamp Tours & Amusement Park” where spriggans roam the park in gangs. A giant visits the local zoo and finds himself becoming a hero in “Blame it on the Trees.” “The Return of Gunnar Kettilson” again relies heavily on Norse folklore as a welcome candle is lit and a young woman and her aunt wait for the return of a family member. I hope not to disappint you or any other reader with the mix of fantasy, myth, and magic that is The Greener Forest. And I hope you and many others will order a copy in advance of its release date from my publisher.